This past weekend was the Capitol Hill Block Party, a small scale music festival in the heart of the hill’s club neighborhood. The Gossip, The Thermals, and Sonic Youth played last night. This morning my iPhone’s digital camera was a visual catalog of bad ideas involving alcohol, but apparently I took some shots of bicycles. 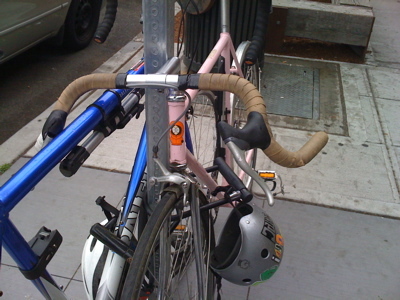 It’s a no name steel road bike in Pepto pink. What’s remarkable about it is old school WTB Dirt Drop bars. Designed in the 1980s by Charlie Cunningham for offroad riding, the Dirt Drop was manufactured by Nitto of Japan. Long since out of production, these things fetch serious coin of eBay nowadays. Such is the demand for wide, flared drop bars for offroad riding, that there is a growing list of companies offering such fare, and WTB has introduced a new design.